It goes without saying that robust malware protection is a critical factor to take into consideration when choosing an antivirus solution, but something that is almost as important is how efficiently the software performs. Antivirus products that consume too many system resources and create noticeable system drag are annoying, disruptive and may encourage users to disable essential protective features. The best security products are able to provide a high level of malware protection without putting excessive strain on your system’s resources. 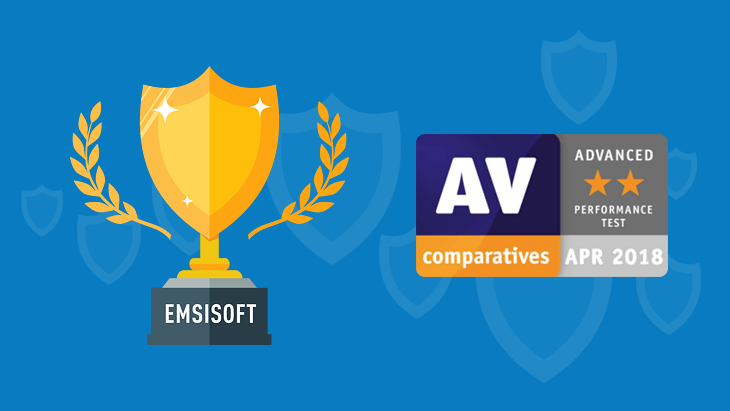 Independent antivirus software testing organization AV-Comparatives recently released the results of its latest Performance Test, and we’re pleased to report that Emsisoft Anti-Malware walked away with an “Advanced” rating! In total, 18 security products were evaluated. The testers used PC Mark 10 Professional to measure the impact of each product on system performance while performing everyday, real-world tasks such as browsing websites, copying and downloading files, launching applications, archiving and unarchiving, and installing and uninstalling applications. Each test was repeated several times to maximize statistical precision, with the median score being used as the final result. The tests were performed on a low-end system: a Lenovo G50 machine with an Intel Core i3-4005U CPU, 4GB of RAM and HDD hard disks. Each security product was installed with default settings on a clean Windows 10 RS3 64-Bit system. We’re happy to announce that Emsisoft Anti-Malware scored “Fast” or “Very fast” in seven of the eight testing categories, which ultimately saw us receive an “Advanced” rating from AV-Comparatives. It is important to remember that this test does not reveal anything about the protection capabilities of a security product, only its impact on system performance in quite specific circumstances. With this in mind, it’s essential that you also investigate how effectively a product can safeguard your system against malware before committing to any antivirus solution. If you’re in the market for an effective security product that won’t devour your system resources, feel free to download a trial of Emsisoft Anti-Malware. AV-Comparatives is an independent organization dedicated to evaluating the effectiveness and efficiency of security software. The group works closely with a number of academic institutions to provide reliable testing methodologies and create high-quality reports that deliver deep insight into the capabilities of antivirus products. Click here to read the full report of the AV-Comparatives Performance Test April 2018, or check out other awards we’ve received in the past here.